Existing literature on the acquisition of surgical skills suggests that women generally perform worse than men. This literature is limited by looking at an arbitrary number of trials and not adjusting for potential confounders. The objective of this study was to evaluate the impact of gender on the learning curve for a fundamental laparoscopic task. Thirty-two medical students performed the FLS peg transfer task and their scores were plotted to generate a learning curve. Nonlinear regression was used to estimate learning plateau and learning rate. Variables that may affect performance were assessed using a questionnaire. Innate visual-spatial abilities were evaluated using tests for spatial orientation, spatial scanning, and perceptual abilities. Score on first peg transfer attempt, learning plateau, and learning rate were compared for men and women using Student’s t test. Innate abilities were correlated to simulator performance using Pearson’s coefficient. 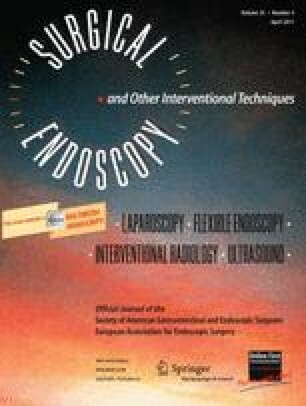 Multivariate linear regression was used to investigate the effect of gender on early laparoscopic performance after adjusting for factors found significant on univariate analysis. Statistical significance was defined as P < 0.05. Nineteen men and 13 women participated in the study; 30 were right-handed, 12 reported high interest in surgery, and 26 had video game experience. There were no differences between men and women in initial peg transfer score, learning plateau, or learning rate. Initial peg transfer score and learning rate were higher in subjects who reported having a high interest in surgery (P = 0.02, P = 0.03). Initial score also correlated with perceptual ability score (P = 0.03). In multivariate analysis, only surgical interest remained a significant predictor of score on first peg transfer (P = 0.03) and learning rate (P = 0.02), while gender had no significant relationship to early performance. Gender did not affect the learning curve for a fundamental laparoscopic task, while interest in surgery and perceptual abilities did influence early performance. Presented at the SAGES 2009 Annual Meeting, April 22–24, 2009, Phoenix, AZ. We thank the McGill medical and dental students who participated in this study. The Steinberg-Bernstein Centre for Minimally Invasive Surgery and Innovation receives an unrestricted educational grant from Covidien. Dr. Kolozsvari receives salary support from the McGill Surgeon Scientist program. Drs. N. O. Kolozsvari, A. Andalib, J. Cao, M. C. Vassiliou, G. M. Fried, and L. S. Feldman and Ms. P. Kaneva have no conflicts of interest or financial ties to disclose.